The Czech developer of video slots for online casinos Endorphina is very famous in the circle of gamblers. The company is now on the wave of success, releasing many successful projects. Meet the slot Lucky Lands and enjoy a great opportunity to play it online for free. The video slot came out quite recently, in July 2018. Will the novelty be as successful as the previous Endorphina projects? This is judged by casino guests. It is worth noting, the slot machine turned out to be quite bright, has an interesting game design. Do not waste time and go for the treasures in Lucky Lands! Developers of modern video slots invest a lot of effort and resources in the graphics component of games. 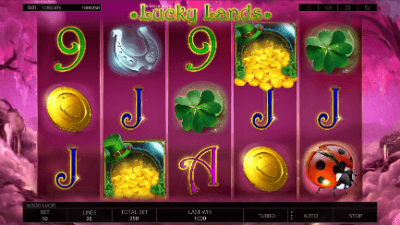 Slot Lucky Lands online is not an exception. Bright and juicy design fascinates literally from the first minute. It's unlikely that you immediately start the game, you want to carefully consider all the game details. The main game character is a leprechaun girl with golden hair and a pot of gold coins, very beautifully drawn. All game images have a smooth high-quality animation. The round with free turns deserves special attention. It looks like a map depicting the Lucky Lands, divided into four parts. They are all different, have an individual style of decoration. The audio tracks are different and correspond to the themes of the selected levels. The game menu looks modest but fits into the overall idea of the game. Be careful, the rate selection buttons do not have the usual arrows or plus and minus signs for adjustment, they are simply highlighted when hovering. In order to change the value by one more, you need to make a click. In general, the design of the video slot is at the highest level. It is a great pleasure to play Lucky Lands for free without registration! The game will take place on five reels in which there are three cells. The betting options are quite large, the player can adjust the number of lines from one to 25. The minimum and maximum bet range from 0.01 to 1 dollar. The slot came out recently, so do not rush to play for money. Examine the paytable and game mechanics. The symbols of the lowest order traditionally are the designations of playing cards with a face value ranging from tens to ace. A clover, a bag of gold, a gold coin with an acorn, a horseshoe - are valued more. The game with free spins has interesting mechanics. You will see a map that is divided into four parts. Each part is a round with free turns, which has its own number of free spins and multiplier of winnings. Thanks to this, the player gets more options to apply his/her tactics.